One of the quieter but stronger episodes of the original DuckTales was “The Curse Of Castle McDuck.” After a number of typical, wild, fun episodes, the old show slowed down some to spend a little time with Scrooge regaling his nephews stories of his past while on a trip to his ancestral home (before the inevitable mystery adventure took hold). It’s nice to see, if for few, scant moments, the nephews eagerly engaged while Scrooge happily tells his story, the show taking a gamble on its characters just talking for a while with the hopes of its young audience staying attentive to it all. That the new DuckTales would crib off one of the original show’s best outings is a sign that the new writers are definitely aware of this as well, regardless of how I may feel about the episodes prior to this one. This, and the final two episodes this season, look to be buckling down into the more serialized aspects of the reboot, allowing said writers to be a bit more focused in their storytelling. "The Secret(s) Of Castle McDuck!" 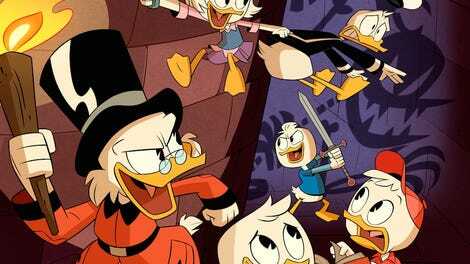 “The Secret(s) Of Castle McDuck!” is the perfect blend of comedy, drama, self-awareness, mystery, danger, adventure, heart, and honesty that I’ve always knew DuckTales was capable of. Not everything worked–Webby’s stunned immobility at being in the presence of so much McDuck history and failing to get any questions answered was a cute bit but gosh it stung a bit–but Bob Snow’s script keeps a clear eye on the individual stakes in both Scrooge’s and the nephews’ journeys, using broad comedy and unique character ticks to prop those journeys up, instead of using them to distract from the lack of clear stakes like in previous episodes. In other words, it feels like things mattered. Scrooge and his father sharing a cathartic laugh parallels the boys sharing their own cathartic laugh (both of which occur over some fairly messed up information), but its all in the service of the dramatic beats that came before it, as opposed to metagags for the sake of them. Scrooge and his father bicker and argue as you’d expect a story like this. Scrooge is bitter that his father never showed him any real love, affection, or even passing admiration on his accomplishments; Fergus possesses similar resentments, but just replace “accomplishments” with “parental appreciation.” Two stubborn Scotsmen at each others’ throats is a solid recipe for entertainment, and with the show visually paralleling that hostility to when Scrooge and Donald met back in the pilot, there’s the realization that it’s a hostility that runs in the family. It’s an idea that’s supported when the Knights Templar treasure is revealed to be a note from Fergus’ father calling him a deadbeat for looking for treasure, a “handout” in McDuck terms (to be fair, I can see the McDucks viewing inheritances as unearned, which... topical). The nephews themselves are on their own adventure of survival and self-discovery, with Dewey trying to hold back from telling his brothers what he knows about their mom. In some ways, Dewey’s behavior makes sense. He doesn’t want to give his brothers hope that their mother may be out there, only for it to be snatched away if all these secrets ultimately lead nowhere. Webby calls him out on this early in the episode, if only to point out that he should be honest with his own brothers, as well as the potential of brotherhood devastation if Dewey’s secret comes to light outside of him just telling them. (I also love that Webby calls out Dewey’s “fake thinking” technique that he pulls when he wants to avoid an issue.) The boys discover a note behind an old picture of Donald though, which leads the three on their quest. And while Dewey tries to hinder their progress, both Huey and Louie showcase their own skills to muster past all the obstacles they face. I’ve mentioned in the past that the show sometimes struggles with Huey, Dewey, and Louie; the recent batch of episodes helped to really put them in better perspective, but the thing that really helped is placing them in connection to one another, instead of utilizing them as singular joke/plot machines. “Day Of The Only Child!” really worked in that regard, and even small playful moments in episodes like “Jaw$!” really show they function best as a unit, even if they’re not “together” per se. Here, they all click, both as a playful batch of brothers and as an adventurous team that work together and need each other, which makes Dewey’s revelation all the more powerful. Dewey tells them the bag they find is their mother’s, as well as all the side ventures he’s been on, and the typical bickering becomes personal. Dewey has his point but Huey calls him out on his selfishness and tendency to want the attention and “specialness” to himself. Dewey, honest with himself for once, admits both not wanting to hurt them and not wanting to be hurt by them (which... came out clumsy and unclear; I think he meant he was in so deep in the mystery of their mom that he didn’t want his brothers angry at him for not telling them). But it’s Louie’s brief, quiet hurt that really sells the moment. Louie rarely, if ever, expresses any raw emotion, which makes his read on “You kept a secret about Mom. That is not okay” all the more devastating.. The adult in me wishes that kind of dramatic beat lasted longer, that the fallout over that revelation and honesty lasted a few episodes, or even a couple of minutes. That Huey and Louie comes to Dewey’s defense as the blue-clad triplet is cornered by the demon dog is rewarding enough though, showcasing that the unity between them, between family, is strong enough to overtake any painful disagreements. (I could take or leave the ghostly backing of the McDuck ancestors, mostly cause that beat felt forced to thematically back the moment over any kind of real narrative purpose.) The triplets share their own cathartic laugh when the discover their mother’s bag, Donald’s hat, and the whole elaborate, riddled mystery and deadly dog was just a giant prank, which kind of deflates things a bit but also is on par for the course for this Duckverse. With two episodes left this season, it looks like we’re in for the homestretch for something big, and honestly I can’t wait. Sorry for the lateness of this review! Had an early bus ride to take care of some stuff, and I had a lot to put down for this excellent episode. Animation peeps! Question: does it seem like this show is animation more and more scenes on ones? There are a lot more fluid, quirkier moments that have been stellar–Dewey running from the demon dog is particularly sharp. If anything, Matthew Humphreys and the entire animation crew needs to get some kind of reward for the stuff they’ve been showcasing. 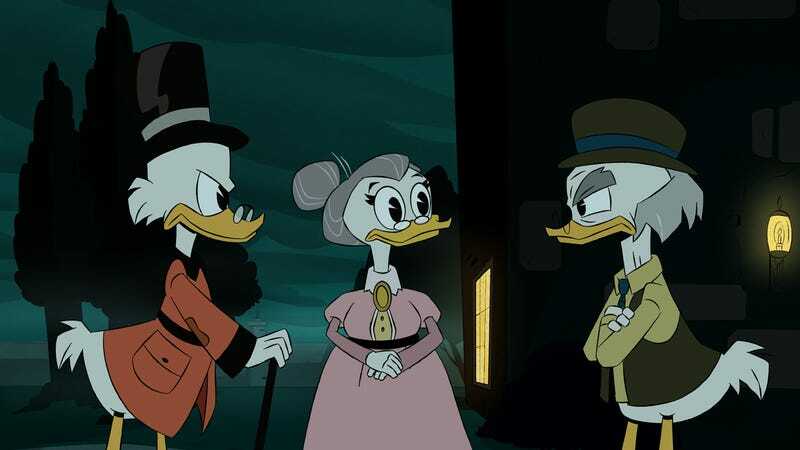 I’ve been keeping a lot of the immortality/Scrooge-lives-forever stuff at arm’s length mostly because the show would play it all as a joke, a kind of running gag that seemed like a play to the idea of Scrooge and DuckTales being around for so long. This episode more or less confirms that all those immortality bits are indeed canon, which is cool! I don’t know what that will mean in the long run but still. Be prepared to explain to your children what a “laird” is. I wish they did more with Scrooge’s mother (Downey is her name, by the way). Launchpad pretending to be Donald was great, especially how his fake temper tantrum immediately won over Fergus and Downey. (Speaking of Donald, totally speculating, but I think the lack of his character in the last few episodes is due to the creative team attempting to reassess how to us someone who’s voice is... hard to discern).